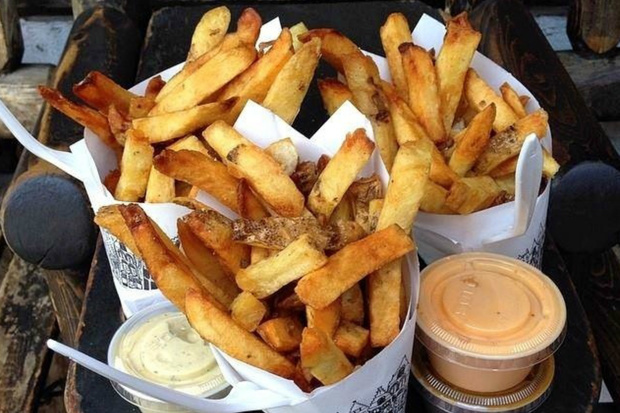 Pommes Frites is a New York City restaurant which specializes in Belgian-style french fries. The restaurant was located in the East Village at 123 2nd Avenue (near 7th Street), but relocated to 128 Macdougal Street after the original building was destroyed in a 2015 natural gas explosion.The restaurant sells only one food item: french fries, served in paper cones, with a variety of sauces to choose from. Fries were prepared in the Belgian style, deep fried twice at two different temperatures.The shop was opened by Susan Levison, a Bronx native, in January 1997 after returning from a backpacking trip through the low countries. (At the time of its destruction, she co-owned the restaurant with Omer Shorshi.) Nine months after it opened, New York Magazine reported that there were lines outside the restaurant every day. At one time, the restaurant had expanded to three locations, but by 2013 only the original location remained.On March 26, 2015, the restaurant was destroyed when the building which housed it collapsed, following a natural gas explosion. No Pommes Frites customers or employees were seriously injured, although an employee and a customer of another nearby restaurant were killed. Pommes Frites reopened on May 23, 2016. Place was small, but this place served some pretty unforgettable french fries. And the sauces they serve with it are out of this world. Rather than stick with the safe mayo flavors with garlic and chipotle, they thought outside the box and came up with some pretty unique flavors that work incredibly well. Staff was super patient, informative, and helpful with assisting us in our very first selection of sauces. Looking forward to coming here again during my next visit to NYC. This is a small place with a couple of seats; also a good place for a snack or when you crave fries. Their doormats are kinda weird and tilt when you step on them. I saw someone fall and I almost tripped myself too. Fries weren't really impressive to me, they weren't as tasty as I remembered. They're thick and maybe a little too fried for me.The regular ($5.25) is good enough for 2 people to share. Maybe it really depends on the sauce you get. I got the rosemary garlic ($1.50) or you can get 3 for $3.75. The sauce was alright, wasn't crazy about it. P.S. You can get free samples of the sauces. They have tons of choices as well, some that are very unique. Ketchup, mustard, and hot sauce is free. Even though the place is small, you really get to love those fries. It is a good place to visit once in a while, and enjoy those tasty fries. So far, I have only tried the Regular Fries with the following sauces: Roasted Garlic, Frite Sauce, Cheese Cheddar, Parmesan Peppercorn and Special. The order represents which one I liked the most (being the first the most I liked). When we when, I ordered a Regular and a friend the Large. After seeing the size of Large, you can see regular is pretty close. I think for me, I won't need a Large. They sell beer and other regular beverages. Prices were really good, and quality of my fries were great. I like crunchier fries, but they were really good.